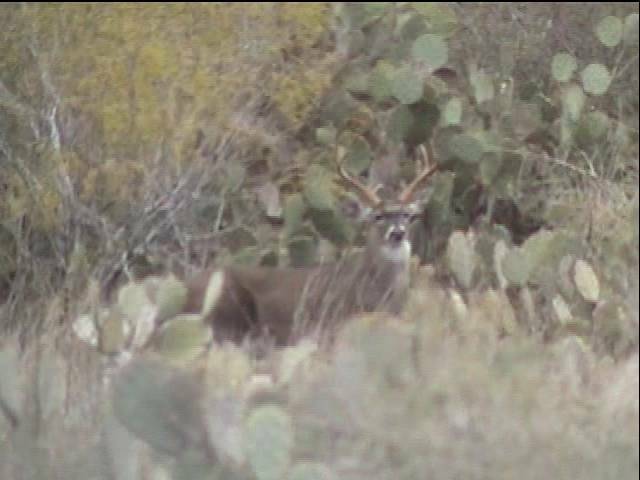 We arrived in Laredo Texas to visit family and do a little whitetail deer hunting on a long weekend. It was a memorable trip for me. On the way down the kids slept some and I enjoyed the county’s scenery. It is always nice to spend some time with my hubby on the drive when the kids are asleep, it gives us some time to visit and catch up on things we normally don’t have time to visit about. We arrived in Laredo and spent some time with family and then the subject of hunting came up as usual. We all agreed to get up early for the hour and half drive to the ranch where we would be hunting. The following morning I saw a few deer come into the feeder but they were a little leery of the ground blind we had put up the evening before. It is always a wonderful time in the blind when you get to see animals, even when those animals aren’t shooters I always feel blessed to get to see them. After the morning hunt Uncle Leo took us over to a friend of his ranch that he had mentioned we could shoot some pigs if we had the desire to do so. After arriving at ranch we took the grand tour. There was a possibility of being invited to shoot an animal but that was solely up to the ranch owner. After meeting with the owner of the ranch it wasn’t long before he sent out an invitation to hunt. We kind of looked at each other and stood around then the owner said.. “Well are you going to get your bows?” To which we did! We drove around the ranch corning the sendero’s and hoping to see some pigs or javis. While corning the sendero’s the deer would just come running out of the brush the minute they heard the tailgate feeder go off. We were lucky enough to see some incredible whitetail deer, some of which were bigger than I had ever seen. I could only dream that I could get a deer that nice and big. Many of the does were very big bodies as well. After driving around a couple of pastures 2 or three times looking for pigs; we were about to give up and head back to the base camp. The owner said, “Why don’t we drive around one more time.” We were like sure, let’s do it. I was feeling a little discouraged at this point, but kept my spirits up and my eyes wide open. We came around one of the corners and low and behold there were javilina’s upon the hill! My heart began to beat faster and faster at the thought of shooting my first javi. We drove a little further up the road and they stopped the truck so that we wouldn’t scare them off the road. Donnie and quickly got out of the truck, me with my bow and him with the camera. We slowly began the stalk up the side of the sendero. As we weaved in and out of the cactus we began to wonder how close they were getting. I crept out to look up the road to see where they were and they were quickly closing the 50 yard gap and sucking up the corn like a good old Hoover vacuum. My heart was pounding and I was beginning to get a little frightened with all the stories about javi’s I had heard in the past; I just knew I would be the one they chased and it would be caught on camera. All of a sudden all the javis were right in front of us. I picked out the one I was going to shoot. Uncle Leo had asked me to shoot a small for him, because they don’t taste good when they are bigger. I thought to myself, dang they don’t taste good anytime! I picked out a small one and looked over at Donnie to be sure he was ready with the camera. He told me to hold on and he moved behind me and we were ready to go. This little javelina was milling around sucking up the corn on the road, finally she turned broadside and was begging for me to shoot her. I quickly pulled my bow back, lined up sights on a sweet spot. I then slowly pulled the trigger on my release, my arrow shot from my bow and slammed into her right where I had aimed and blew right threw and out the other side. My heart felt like it was going to come out of my chest.